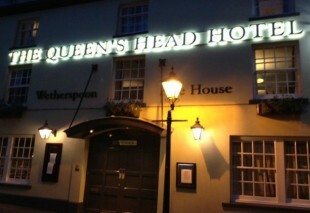 Wetherspoons ramps up hotel market expansion with new pub. A new pub with rooms is gearing up to launch next week, which will mark another expansion into the hotel market for pub chain, JD Wetherspoons. The Queen’s Head Hotel in Tavistock, near Dartmoor has been given a £2.64m transformation ahead of its opening next week, converting the 18th century former Browns Hotel into a 12-bedroom boutique hotel. The pub was put on the market in 2013 and is now owned by JD Wetherspoons, who have brought in Trevor and Jo Huckle as managers of the new business to help drive the pub chain’s expansion into the sector further. The company has spend £2.64m developing the pub and hotel, a three-storey property that is one of the several listed buildings on one of Tavistock’s oldest thoroughfares. The property now boasts a completely new design, but still in keeping with the building’s history and heritage, and now consists of a mix of both old and new features. Students at the nearby college have created artworks to go on display in each of the hotel’s bedrooms, while historical photographs, details of local history and information on events, buildings and old characters of the area, are on show downstairs in the pub. The pub was a popular venue when it was owned and run by Helena King as Browns Hotel, who also invested £1m in the Grade-II listed building before putting it on the market in 2013. The hotel is part of a major expansion for the pub chain, renowned for its budget pricing, into the hotel market to strengthen its holdings, adding to its now 30-plus strong hotel brand. The chain has been looking at expanding its hotel arm of the business across the South West and has been in negotiations for other sites across the region, with some of those plans underway including at Camborne in Cornwall, where there are plans for a 37-bedroom hotel.